"Tiger & Wolf Brothers 虎狼兄弟 (hǔ láng xiōng dì)"
The top 2 military generals under Yuan Shao 袁绍, Yan Liang and Wen Chou were good friends and were said to be equal in combat skills. The story did not give them much air time, but enough mention was made to highlight their ability. Under the early coalition led by Yuan Shao, a formidable opponent called Hua Xiong 华雄 challenged the coalition and killed many generals. Yuan Shao lamented that both Yan Liang and Wen Chou were not around, else they would surely destroy Hua Xiong easily. Later parts of the story did not mention both Yan Liang and Wen Chou together in combat, but these two are typically associated. It does seem like their capabilities were over-promised as both fell victim to Guan Yu 关羽. 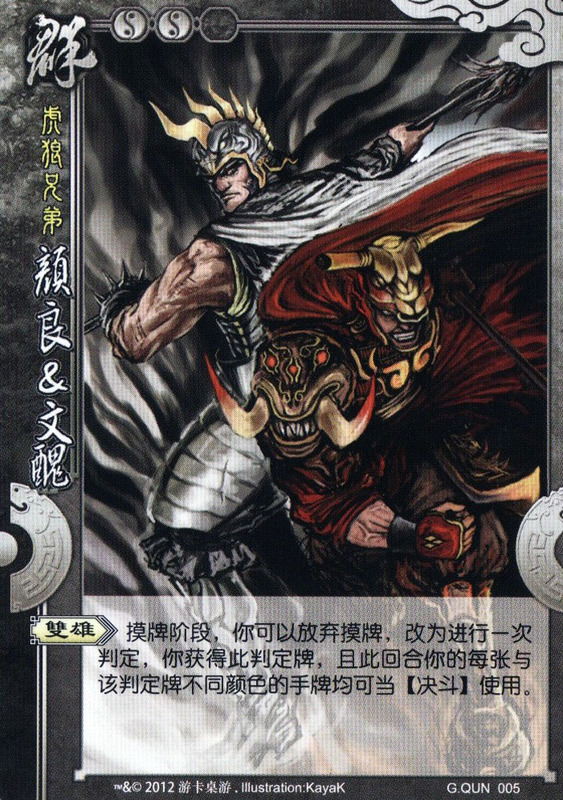 Character ability: "Dual Heroes 双雄 (shuāng xióng)"
During your draw phase, you can forfeit drawing cards from the deck and make a judgement instead. You acquire this judgement card, and you can use an on-hand card with the different colour of the judgement card as DUEL决斗 in this turn. Very little relation can be drawn from the story linking DUEL to these two characters. All that is known is that both of them are commonly referred together as a pair, thus the name "Dual Heroes". They were known for their combat abilities, and dueled with Guan Yu in the story. Eventually, they were killed by Guan Yu for their incompetence in the duel. 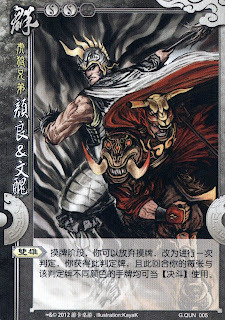 As a result, they can convert on-hand cards to DUEL, and Guan Yu, the man who killed them, is almost invulnerable to DUEL (he can convert red cards to ATTACK) and can strike back Yan Liang & Wen Chou easily.